He and his wife, Savanna Sue Walls have three children: Marley Katerine (6/11/11), Elodie Casey (2/1/14) and Auden Alexander (11/2/16)... Attended Colegio Mercedes Laura. Appeared in 50 games with Philadelphia and batted .225/.276/423 in 71 at-bats…Made his third career Opening Day roster, and his first since 2014 with Minnesota... Missed 82 games after suffering a right foot fracture…Was placed on the disabled list on 5/30 prior to being reinstated on 9/1... Appeared in 15 rehab games between Triple-A Lehigh Valley, Double-A Reading, High-A Clearwater, the GCL Phillies East and the GCL Phillies West...Made two appearances as a pitcher, his first appearances on the mound in the majors… Combined to allow one hit, one walk, and two runs in 2.0 innings...Made his pitching debut on 3/31 at ATL and allowed a two-run home run to Lane Adams…Was the first Phillies position player to pitch since Andrés Blanco on 6/7/17, also at Atlanta... On 5/18 at StL, became the first Phillies position player to hit a home run while in a game as a pitcher in the modern era (since 1900) and first MLB player to do it since the Cubs' David Ross on 7/26/15 ...Homered on 5/17 at StL for the first time since 9/27/13 … Went 220 at-bats (240 plate appearances) between home runs...Homered again the very next day, 5/18 at StL, and homered in consecutive games for the first time in his career...Made nine starts defensively, including eight at shortstop and one at second base. Began the season with Lehigh Valley (AAA)... Appeared in games for the IronPigs at 2nd base (33), 3rd base (25), SS (15), LF (7), CF (1) and RF (6)...Collected a season-best 5 hits, 5/17 at Rochester...Hit .300 (21-70) with RISP...Had his contract selected on 8/17...Made 12 ML starts: 8 in CF and 1 each at 2nd base, SS, LF and RF...On 8/19 at SF, recorded his first ML hit since 9/18/16, breaking an 0-for-16 stretch... Made his 1st ML start in LF on 8/20 at SF and collected his 1st ML outfield assist; made 1st ML start in CF on 8/25 vs CHI...Suffered a right ankle dislocation on an infield single, 9/2 at MIA, to end his season ... Was placed on the 10-day DL on 9/5. Began season with Triple-A Indianapolis...Was designated for assignment and dropped off the 40-man roster on 4/5...Hit .394 (13-for-33) with three doubles, one triple, one home run and four RBI in 10 Triple-A games during the month of July...Was selected by Pittsburgh on 7/22...Made season debut with the Pirates as the starter at shortstop on 7/22 at Kansas City and went hitless in three at bats...Delivered walkoff triple in the 15th inning on 8/18 vs. Arizona (first career walkoff hit)...Was designated for assignment on 8/19...Cleared waivers and was assigned to Indianapolis on 8/25...Played three Triple-A games before being selected by Pittsburgh on 9/2...Made a total of 44 appearances at shortstop, 14 at third base, four at second base and one in left field while playing with Indianapolis...Was selected by Pittsburgh on 9/2 and appeared in eight games (went hitless in four at bats)...Played in 16 games with Estrellas during the Dominican Winter League. Began season with Minnesota - his second straight on the club's Opening Day roster...Tallied lone RBI with Twins in his first start on 4/2 at Chicago (AL)...Went 7-for-65 (.108) in 25 games (22 starts) at shortstop thru 5/7...Was optioned to Rochester (Twins' AAA) on 5/8...Was recalled on 6/15 and went hitless in 13 at bats with the Twins thru 6/28...Was optioned back to Rochester on 6/30 and finished season at the Triple-A level...Hit .275 (22-for-80) in July and .270 (27-for-100) in August...Shared Rochester team lead in triples and ranked second in stolen bases...Made 65 appearances at shortstop, 11 at third base and seven at second base with Rochester...Was claimed off waivers by Washington on 9/18...Was claimed off waivers by Pittsburgh on 11/20...Played winter ball in the Dominican Republic and hit .253 (23-for-91) with three doubles, a homer and four RBI in 27 games with Escogido. Made first career Opening Day roster, beginning the season as the Twins starting shortstop April 1 vs. Detroit... Reached base in first 10 games April 1-16, posting a .484 on-base percentage in that span... Hit first home run of the season and second of career May 8 at Boston... Went 30 straight games without committing an error April 27-June 4... Hit four home runs in July, tied with Justin Morneau for most on the club during the month; his 11 RBI that month tied him with Brian Dozier for most... Played in 133 games (127 starts) at shortstop, the most for a Twin since Jason Bartlett played 138 in 2007...his 133 games at short were seventh most in the AL... Hit all nine of his home runs from the left side of the plate...most home runs by a Twins shortstop since Cristian Guzman hit nine in 2002... Led the Twins in stolen bases (15) and ranked third in games played (134)... Given the second annual Jim Kaat Award as Twins Defensive Player of the Year, voted on by the Twin Cities chapter of the BBWAA. Began season with Double-A New Britain, batting .283 (32-for-113) in 30 games, committingjust three errors. ... Promoted to Triple-A Rochester May 7. ... Hit safely in 11 of first 13 games for Red Wings, including first home run May 8 at Pawtucket. ... Played all 83 of his games for Red Wings at shortstop, committing just nine errors. ... Had contract selected by Twins August 15 when Brian Dozier was optioned. ... Made Twins debut August 17 at Seattle starting at shortstop, going 0-for-3. ... Recorded first hit as Twin with a triple (first triple of career) August 18 at Seattle. ... Had first career three-hit game August 20 at Oakland. ... Hit first major league home run, a solo shot off Cory Wade September 24 vs. New York-AL. ... Led entire Twins organization in games played (156) and strikeouts (147), ranked second in at-bats (561) and seventh in hits (140). ... Ranked by Baseball America as having the best infield arm in the International League. Was recalled from Double-A Bowie September 6 and made his Major League debut, September 10 at Toronto...Recorded his first Major League hit with a game-tying two-run double off Brad Penny, September 25 at Detroit...Spent the regular season with Double-A Bowie, batting .267 (121-454) with eight homers and 60 rbi in 133 games at shortstop...Drove in a season-high five runs, June 30 at Binghamton and drove in four runs, July 19 at Harrisburg and September 4 against Erie...Went 11-for-20 (.550) from June 26-30 with three doubles, two homers and eight rbi and hit .320 (31-for 97) in 28 July games. Had a season high 3 hits on July 10 against Greenville. Hit .197 in 111 games for Delmarva...Recorded a season-high 3 hits and 2 runs scored, April 27 at Hagerstown and July16 at Lakewood. Began the year at Bluefield and hit safely in 25 of 33 games, with 10 multi-hit performances...Had 4 straight multi-hitgames, July 8-12, to push his average to .457 through his first 13 games of the year...Was transferred to Aberdeen on August7 and hit .271 through his first 12 games...Went 3-for-31 over his next 8 games to drop his average to .203 before batting .385(10-26) over his final 6 games. Played in 63 games for the San Pedro Orioles in the Dominican Summer League and batted .200 (34-170) with 8 RBI and35 runs scored...Was 2nd on the team with 19 stolen bases. Led the San Pedro Orioles with 16 stolen bases...Batted .213 (34-160) with 19 RBI...Committed 29 errors in 48 games. April 24, 2019 Gwinnett Stripers placed SS Pedro Florimon on the temporarily inactive list. January 28, 2019 SS Pedro Florimon assigned to Gwinnett Stripers. November 22, 2018 Atlanta Braves signed free agent SS Pedro Florimon to a minor league contract and invited him to spring training. 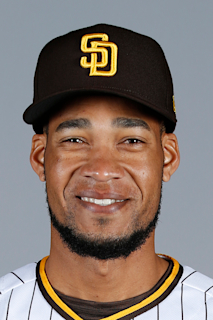 November 2, 2018 SS Pedro Florimon elected free agency. November 2, 2018 Philadelphia Phillies sent SS Pedro Florimon outright to Lehigh Valley IronPigs. September 1, 2018 Philadelphia Phillies activated SS Pedro Florimon from the 60-day disabled list. August 27, 2018 Philadelphia Phillies sent SS Pedro Florimon on a rehab assignment to Lehigh Valley IronPigs. August 23, 2018 Philadelphia Phillies sent SS Pedro Florimon on a rehab assignment to Reading Fightin Phils. August 14, 2018 Philadelphia Phillies sent SS Pedro Florimon on a rehab assignment to Clearwater Threshers. August 13, 2018 Philadelphia Phillies sent SS Pedro Florimon on a rehab assignment to GCL Phillies West. August 11, 2018 Philadelphia Phillies sent SS Pedro Florimon on a rehab assignment to GCL Phillies East. July 10, 2018 Philadelphia Phillies placed SS Pedro Florimon on the 60-day disabled list retroactive to May 30, 2018. Right foot fracture. May 30, 2018 Philadelphia Phillies placed SS Pedro Florimon on the 10-day disabled list. Right foot fracture. March 16, 2018 Philadelphia Phillies selected the contract of SS Pedro Florimon from Lehigh Valley IronPigs. January 3, 2018 Philadelphia Phillies signed free agent CF Pedro Florimon to a minor league contract and invited him to spring training. January 3, 2018 CF Pedro Florimon assigned to Lehigh Valley IronPigs. November 6, 2017 CF Pedro Florimon elected free agency. November 6, 2017 Philadelphia Phillies sent CF Pedro Florimon outright to Lehigh Valley IronPigs. November 2, 2017 Philadelphia Phillies activated CF Pedro Florimon from the 60-day disabled list. September 5, 2017 Philadelphia Phillies placed CF Pedro Florimon on the 60-day disabled list. Right ankle dislocation. August 17, 2017 Philadelphia Phillies recalled CF Pedro Florimon from Lehigh Valley IronPigs. December 21, 2016 SS Pedro Florimon assigned to Lehigh Valley IronPigs. December 12, 2016 Philadelphia Phillies signed free agent 2B Pedro Florimon to a minor league contract and invited him to spring training. November 2, 2016 3B Pedro Florimon elected free agency. November 2, 2016 Pittsburgh Pirates sent 3B Pedro Florimon outright to Indianapolis Indians. September 6, 2016 Pittsburgh Pirates selected the contract of 3B Pedro Florimon from Indianapolis Indians. April 25, 2016 LF Pedro Florimon assigned to Indianapolis Indians from West Virginia Black Bears. April 16, 2016 SS Pedro Florimon assigned to West Virginia Black Bears from Indianapolis Indians. April 13, 2016 Pittsburgh Pirates sent SS Pedro Florimon outright to Indianapolis Indians. April 3, 2016 Pittsburgh Pirates designated SS Pedro Florimon for assignment. November 2, 2015 SS Pedro Florimon assigned to Estrellas de Oriente. September 2, 2015 Pittsburgh Pirates selected the contract of SS Pedro Florimon from Indianapolis Indians. August 25, 2015 Pittsburgh Pirates sent SS Pedro Florimon outright to Indianapolis Indians. August 25, 2015 Indianapolis Indians activated SS Pedro Florimon. August 19, 2015 Pittsburgh Pirates designated SS Pedro Florimon for assignment. July 22, 2015 Pittsburgh Pirates selected the contract of SS Pedro Florimon from Indianapolis Indians. April 11, 2015 Pittsburgh Pirates sent SS Pedro Florimon outright to Indianapolis Indians. April 5, 2015 Pittsburgh Pirates designated SS Pedro Florimon for assignment. November 20, 2014 Pittsburgh Pirates claimed SS Pedro Florimon off waivers from Washington Nationals. October 13, 2014 Washington Nationals activated SS Pedro Florimon. October 3, 2014 Washington Nationals reassigned SS Pedro Florimon to the minor leagues. September 20, 2014 Washington Nationals activated SS Pedro Florimon. September 18, 2014 Washington Nationals claimed SS Pedro Florimon off waivers from Minnesota Twins. June 30, 2014 Minnesota Twins optioned SS Pedro Florimon to Rochester Red Wings. June 15, 2014 Minnesota Twins recalled Pedro Florimon from Rochester Red Wings. May 9, 2014 Minnesota Twins optioned SS Pedro Florimon to Rochester Red Wings. August 15, 2012 Minnesota Twins selected the contract of Pedro Florimon from Rochester Red Wings. May 7, 2012 Pedro Florimon assigned to Rochester Red Wings from New Britain Rock Cats. April 3, 2012 Pedro Florimon assigned to New Britain Rock Cats from Rochester Red Wings. February 2, 2012 SS Pedro Florimon assigned to Dominican Republic. December 12, 2011 Minnesota Twins sent Pedro Florimon outright to Rochester Red Wings. December 5, 2011 Minnesota Twins claimed Pedro Florimon off waivers from Baltimore Orioles. September 6, 2011 Baltimore Orioles recalled Pedro Florimon from Bowie Baysox. April 6, 2011 Pedro Florimon assigned to Bowie Baysox from Norfolk Tides. March 11, 2011 Baltimore Orioles optioned Pedro Florimon to Norfolk Tides. October 13, 2010 Pedro Florimon roster status changed by Baltimore Orioles. June 26, 2010 Pedro Florimon assigned to Frederick Keys from Bowie Baysox. June 21, 2010 sent SS Pedro Florimon on a rehab assignment to Aberdeen IronBirds. May 25, 2010 Pedro Florimon roster status changed by Bowie Baysox. March 26, 2010 Baltimore Orioles optioned SS Pedro Florimon to Bowie Baysox. November 18, 2009 Baltimore Orioles selected the contract of Pedro Florimon from Bowie Baysox. October 24, 2009 SS Pedro Florimon assigned to Leones del Escogido. September 1, 2009 Pedro Florimon assigned to Bowie Baysox from Frederick Keys. May 11, 2009 Pedro Florimon roster status changed by Frederick Keys. April 8, 2009 SS Pedro Florimon assigned to Frederick Keys from Delmarva Shorebirds.